August 2017--I'm happier than a two dicked dog. 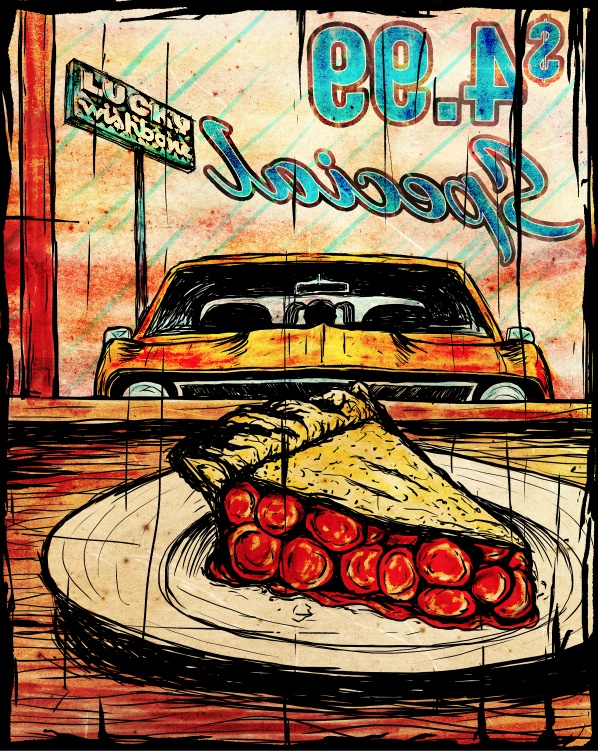 My short story Lucky Wishbone, a grim tale about human trafficking, fatherly advice, and strawberry pie (and originally published in Heater Magazine (Volume 3, Number 8)), has started its journey to the silver screen. Yep, the story recently caught the eye of a Phoenix filmmaker who wants to retell it in full Technicolor, ten feet high. I asked for first crack at the screenplay and emerged from a self-administered, eight-week crash course on screenwriting with a script. He dug it, and as soon as some other projects of his and mine are wrapped, he's gonna shoot the thing. Can't wait to see him ply his trade. More to come as details emerge, folks! To tide you over, check out this awesome Lucky Wishbone artwork by the talented Quinn Murphy of Hamster Laboratories. Thanks to Ofelia and all the good folks over at PHOENIX magazine. February 2017--I love to sit down with other writers and talk writing. It's something I do as part of my Spillers After Show podcast, the Phoenix New Times Best Podcast, 2016 winner. So when I was asked by the GoDaddy Blog folks to write an article about freelance writing, I wanted to sit down with my buddy Connor Rickett, a man who depends on freelancing to put unleaded in his Subaru's gas tank. The ensuing conversation was great and led to this article/podcast interview. Enjoy! This is my best interviewer face. Yep, that's the one. Hear my reading of "Eel Sauce Blues"
December 2016--It was a thrill to take the Spillers No. 6 stage not to introduce another writer but to read my own short fiction. Here's how I debuted my tale of revenge and jazz and Chinese food. Enjoy! December 2016--It's like my granddad always used to say: "What's the use of founding Phoenix's best short fiction reading event if you can't read your own goddamn stories once in a while?" Well, I took granddad's advice and at Spillers No. 6 I not only wore my lucky red pants, but also two hats--one as co-host and the other as a Spiller. Yep, I read my original short story "Eel Sauce Blues" to a great crowd at Crescent Ballroom. It was a blast to read a tale about jazz, Chinese food, and revenge. I got the full Spiller treatment, including my own Spillers After Show podcast episodes which I'll link to as soon as they're ready. It was the best way to wrap up a stellar writing year. Illustration courtesy of the talented Quinn Murphy at Hamster Labs. I'm reading at Spillers No. 6! December 2016--As the co-founder and co-host of Spillers--Phoenix's premier short fiction storytelling event--I've had the pleasure of helping put immensely talented writers on the Crescent Ballroom stage in front of sophisticated and appreciative literary crowds. For the upcoming Spillers No. 6 on Tuesday, December 13, I get to sport both host and participant hats. Yep, I'm reading my short story "Eel Sauce Blues." It's a tale about the intersection of jazz, retribution, and Sichuan Chinese food. It was a blast to write, I can't wait to read it, and I hope the crowd digs the thing. October 2016--How do the rules for drama laid out by Aristotle in his book Poetics over 2,000 years ago apply to modern day web design? If you have to ask, you didn't attend my recent presentation (along with fellow writer Jeff Trumpold) at GoDaddy's first annual UXFest. We extracted a handful of Poetics concepts that help UX folk create superior experiences for users. Afterwards we were lauded for our engaging and funny presentation style. It was a blast, and we owe it all to everyone's favorite big-thinking Greek guy. September 2016--I know someone at Desert Trails Elementary School. Okay, it's my daughter. She's in fourth grade and not yet at that age where it's embarrassing for your dad to speak to all your friends about what it's like to write for a living, so that's precisely what I did recently. I even threw in a fun exercise I like to call "write the last line of the craziest story, ever." It was a hoot. The students were enthused and respectful and peppered me with questions. I can only hope a future Stephen King or Flannery O'Connor was in the crowd. Me talking about writing--*not* demonstrating how to draw black cats. September 2016--Phoenix New Times is a tastemaker, and nowhere is that more on display than their annual "Best of Phoenix" issue--a guide to the best, tastiest, and all around coolest stuff to do, eat, and experience in the sixth largest city in the country. A category win gives a person serious creative capital and substantial bragging rights, so it's with considerable pride that I tell you my podcast Spillers After Show was named Best Podcast in the 2016 BoP issue! Whew! It's all still sinking in. The podcast is a blast to do and has given me the opportunity to interview some very talented and entertaining writers. This type of recognition is incredibly rewarding--the buttercream icing on an already tasty cake. Read the New Times' writeup to see the flattering things they have to say about the podcast, and then listen for yourself! I love to see my name in print. August 2016--We celebrated with cake. More importantly, Spillers No. 5 commemorated Spillers' 1-year anniversary in style with short fiction readings by Anne Heintz, Kathryn Hill, Aurelie Sheehan, Ed Kearns, and T.M. McNally to a crowd of 150+ at Crescent Ballroom. I couldn't have co-hosted a better event. Read the full recap here. We ate cake. Oh, did we eat cake. "Marriage Material" is on Shotgun Honey! August 2016--My story's published, just like the good people at Shotgun Honey said it would be. Start reading below and then click for the rest. Warning: it's on the salty side. Enjoy! My short story "Marriage Material" to publish soon! July 2016--I've always liked the crime fiction website Shotgun Honey because the stories there really kick you in the gut, so I'm excited that they're going to publish my latest short story, "Marriage Material." Look for it on 8/22, people! July 2016--Always on the lookout for cool, Phoenix-centric stuff, the good folks at Phoenix New Times named my podcast, Spillers After Show, to its "10 Metro Phoenix Podcasts You Have to Hear" list! Always nice to be on the receiving end of recognition. It appears I'm making a particularly salient point. My third McSweeney's piece is live! Mar. 2016--My humor piece "I Portray Middle-Aged Men Living Life to the Fullest in Prescription Drug Commercials" is on McSweeney's Internet Tendency and getting big love from the Facebook and Twitter crowds. It's funny as hell, so read it! Coming soon--McSweeney's Internet Tendency piece! Feb. 2016--Sometimes you have to break the rules--even your own rules--to do right by the user. I wrote a piece on when and how I deviate from my normal writing tone, and the good folks at UX Magazine went and published it. Read "Don't Take That Tone With Me" and make your own writing a little more human. Published humor piece on Splitsider! Feb. 2016--My humor piece "I’m Changing This Bar’s Jazz Jam Session Rules" is up on the very cool comedy website Splitsider. It's a meditation on the fragile state one of this country's hallowed musical institutions finds itself in. Plus, it's really funny. Feb. 2016--I couldn't be more thrilled with how Spillers--Phoenix's premier short fiction storytelling event I co-host--went off tonight. The pre-event interest was such that the good folks at Crescent Ballroom put us into the big ballroom. The good folks of Phoenix packed the place to enjoy six local writers--Keith Rawson, Troy Farah, Ed Tankersley, Leah Newsom, David Nicol, and Patrick Michael Finn--read their best short fiction. Thanks to all involved! Jan. 2016--I have some good publishing stuff coming up soon, like a humor piece on the comedy website Splitsider (I love that site), an article in UX Magazine (they're an industry name), and a short story in Rock Bottom Journal. That's three different styles for three different audiences all publishing within a few weeks of each other. I've got range, baby. 2015--My musical tastes were formed early. While my grade school brethren listened to the popular stuff, I went nuts for jazz. The music made my head spin. So did my encounter with George Frazier's liner notes. This is the true account of what went down. 2015--My short story Stoma Hole is in volume 2, issue 4 of The Oddville Press. Read it to see why smoking, sword swallowing, and stomas are fun on their own but better together. I'm talking about creativity, people! 2015--Here I am, mic in hand, speaking at a Dribbble (yep, that's with three b's) event about how to work your 9-to-5, keep your home life humming, and still muster the time and energy to work on your own creative projects. Got a great response from a very cool crowd. A gratifying night, to be sure. Thanks, all!